95 mm square newel caps with a subtle pyramid shape on top to give them a more decorative look and feel. Newel caps are the perfect way to finish a plain newel post and these suit standard 90mm square newel posts. 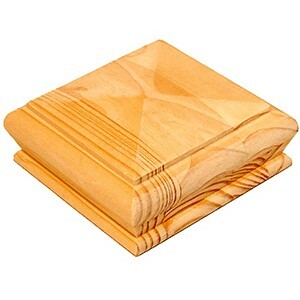 These pyramid newel caps are available in a range of sizes to accommodate different sizes of square newel posts. These newel caps range from 95mm x 95mm up to 150mm x 150mm, to suit larger newels, often used for grander staircases.